HA note: The following is reprinted with permission from Latebloomer’s blog Past Tense Present Progressive. It was originally published on September 27, 2012. To briefly review, my first criticism of Reb Bradley’s book “Child Training Tips” discussed the way his advice pushed parents toward the worst possible interpretation of their child’s behavior at the expense of mercy and understanding. My second criticism looked at the extreme level of control that parents are urged to have over their child’s mind and body, which can prevent the child from maturing and can put the parent at risk of developing abusive habits. My third criticism looked at the shockingly broad definition of rebellion and the abusive use of spanking to force children to change their opinions and feelings. My fourth criticism discussed how isolation weakens families by removing other sources of support, and how isolation negatively affects children’s social and emotional development. Being a parent is incredibly challenging, and the constant stream of conflicting advice about parenting only adds confusion to the challenge. There’s an extra level of stress for many devout Christian parents because raising upstanding citizens is not enough for them; they also desperately want their children to share their faith and religious convictions. It’s not surprising that even good and caring Christian parents could get sucked into this severely authoritarian parenting approach, believing it to be in their children’s best spiritual interests; they need to feel in control of their child’s destiny because they believe the stakes are so high. 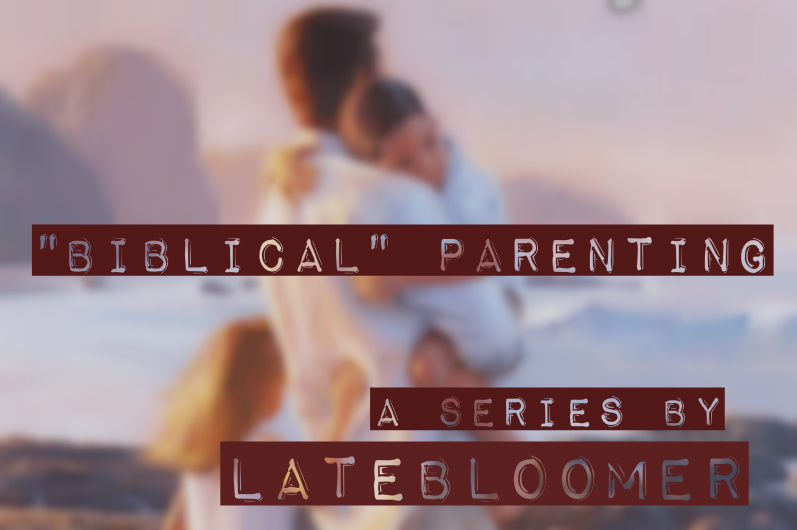 If you are one of those parents, perhaps it will be a little easier for you to see the relational damage of this parenting approach if you witness a parent outside of your own faith employing these techniques on their child. Is it ok for an atheist, Buddhist, Muslim, Hindu, or Orthodox Jewish parent to force their child to follow their beliefs about religion, punish their child for expressing disagreement, and isolate their child from other influences? In another religious context, doesn’t this look like abusive parenting? Doesn’t it look like the parent cares much more about their own opinions than about their child? Don’t you feel sympathy for the poor child, and suddenly find yourself believing that the parent ought to let their child have the freedom to choose his or her own opinions? What makes you think that the experience is any different for the child if the parent happens to be a Christian? Yes, it’s hard to realize that your child’s destiny is outside of your control, but it can also be incredibly freeing. It allows you to be relationship-focused rather than goal-oriented toward your child. Parenting mistakes are impossible to avoid, but as much as possible, let your errors be on the side of unconditional love, mercy, forgiveness, understanding, patience, grace, peacefulness, kindness, gentleness, and self-control. A parent who personally lives a sincere and virtuous life and who also has a positive, open, and accepting relationship with their child will make a much more valuable contribution to their child’s life than any parenting technique from this book ever could. If your children are already grown and your relationship with them is strained, please don’t underestimate the power of a heartfelt apology, of repeatedly telling them how proud you are of them (without a hint of disapproval), and of absolutely never giving them unsolicited advice. My own nearly-destroyed relationship with my dad was able to come back from the brink of total destruction because of these changes that he made. Today, amazingly, we actually respect each other and enjoy each other’s company. It’s very likely that your parents had your best interests in mind, and that they made personal sacrifices in order to participate in this lifestyle. Because of this, they may be very resistant to acknowledging that their choices caused you harm. Don’t let that stop you from processing your past for yourself, acknowledging your own feelings, and trying to overcome the negative effects of that lifestyle for yourself. — the defensiveness of people who feel threatened because they have not come to terms with those experiences for themselves. Realize that your emotional pain, like physical pain, is there for a reason, and should not just be ignored. Luckily, it is possible to face your past and create a better future for yourself, even without the support of your parents. You may feel like you don’t deserve to be loved. You may have a lot of trouble having and voicing your own opinions. You might avoid getting close to people out of fear of rejection. You might feel disconnected from the rest of the world and excessively worried about its dangers. You may feel socially lost, confused, and anxious. You might feel like you don’t know how to enjoy yourself or have fun. You may feel like every problem or even emotion you have is nothing more than your own spiritual failure. These are some of the effects that I experienced, but every person is different; some people are affected more while others are affected less. I personally found it helpful establish a lot of personal space between my parents and me, meet a lot of different kinds of people, hear about the experiences of others who have left fundamentalism, talk extensively about my own experiences and memories with a few empathetic and nonjudgemental people, experience unconditional love from my spouse, and see a good therapist. There have been ups and downs, of course, but overall the life I have today is better than I ever imagined possible. I hope for the same for you! Feel free to share your perspective, opinions, and experiences in the comments, or send me an email: pasttensepresentprogressive [at] gmail.com. LOVED your whole series. I think you had a fantastic point about children who were raised this way thinking about the fact that their parents, though mistaken, did these things with good intentions. This fact does not make anything okay but you come to understand and even show mercy toward your parents. The thought can be a beginning in healing. I saw these comments from Reb Bradley on Josh Hariss’s blog. Has he seen the light or just trying to excuse himself? He makes many points that you highlight. So what if you have a change of heart after you are already married and have a bunch of kids and your spouse doesn’t agree? What if your disagreements are not severe and your spouse is pretty understanding and loved you and your kids, but thinks you are getting just a little too progressive or liberal? “The baby and the bath water” and all that? That was one of the most painful things I’ve read in a very long time. I had similar, though fortunately less severely restrictive, experiences growing up. Though I had a lot more leeway than Bradley’s book recommends, punishments were typically fairly brutal, and common for very minor infractions, such as talking too loud or getting bad grades in school. My family was also of the opinion that “secular” therapy was garbage, and things like learning disorders, developmental disorders, and depression were mostly mythical (unless they were severe and obvious). They were all nothing more than “discipline problems” and the cure was beating. Similarly, bad grades did not indicate a lack of understanding of the subject, nor did it indicate poor teaching, it was strictly a result of lack of discipline and effort, which could be cured by more beatings. What’s really, most fundamentally wrong about Bradley’s book is that he completely fails to understand the passage he bases so much of his own warped philosophy on: “Spare the rod and spoil the child”. The “rod” was a common implement used for herding livestock; and therefore a metaphor that would be commonly understood by peoples who lived by herding (such as the biblical Hebraic peoples). Herding livestock does not involve beating them with a stick, but using it to guide them by lightly tapping or pressing on the animals, and relying on their natural reflexes and instincts to achieve the desired result. Animals trained this way could generally be relied on to need very little physical control under normal circumstances. Animals that were more difficult to control could get more forceful applications of the rod, but this could also have the results of pushing the animal into panic and fight-or-flight if overdone. There are more cautions against overuse of discipline and control for both children and livestock in scripture than there are advocating its application. I am a home schooling parent and have one daughter who is a freshmen at a christian liberal arts college in Ohio. Years ago, the Holy Spirit showed me the error of this type of parenting that is prevalent in home schooling circles and in extreme conservative churches. I had a friend that used the wooden spoon quite frequently to keep her kids in line… and after I talked with her about how I was lead away from corporal punishment etc… I felt like my child was picked apart for any tiny infraction now. I cried out to God about how I was parenting asking Him to correct me if I was wrong, but the answer kept coming back to me that I He had shown me the way, now walk in it. I have made my fair share of parenting mistakes.. yelling at times… etc… but by the grace of God, He is molding me to show unconditional love and mercy to each of my children each and every day. My adult daughter called from college during the semester and said, “MOm, God is so so kind. ” And that statement hung in the recesses of my mind… if He is so kind I must be kind to others starting with my children. One profound God has been reminding me of lately is how much I am loved and cherished and how much I can love and cherish when I allow Him to deeply love me. I am so thankful that God lead me away from this type of parenting. A book I rather love is Crystal Lutin’s Grace based parenting. We really do not have control over the path our children take.. it is their choice and theirs alone to make. Thank you for these articles. My husband saw Reb at a home schooing convention and he was humbled… hopefully God will continue to work in his life and mend the broken relationships he has experienced in his home.